Editor’s note: This is a story written by Meg McGuire, wife of AMR contributor Christopher Mele. Meg is the publisher and editor of free apps for dating sites, an online news magazine dedicated to covering the entire length of the Delaware River. It is published here with permission — and mostly because Chris thought it was such a cool story and worth sharing with AMR readers! Thunderstorms danced through Dover, Del., most of the afternoon on May 25. It was the new moon and the Delaware Bay was shrouded in darkness. Undeterred, out of the sea they came. 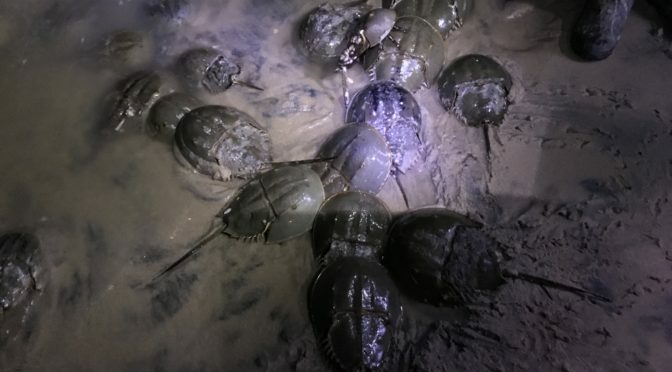 Hundreds, likely thousands, of American horseshoe crabs, creeping along the edge of the shoreline, males looking for females and females looking for just the right spot to lay their eggs. Too high and the sand would dry out and that’s not healthy for the eggs. Too much water and it would be difficult for males to fertilize the eggs. They know what “just right” is — after all, they’ve been doing this for thousands of years. And not just here on North Bowers Beach, but all over the shores of the Delaware Bay, which is the largest spawning ground of this critter (family name is Limulidae). North Bowers Beach, De., during the day at low tide — no crabs in sight. They’re waiting for high tide. There are four species of horseshoe crab, our Delaware Bay variety is properly called Limulus polyphemus. At least that’s what we humans call them. They don’t seem to care. They also don’t seem to care that they are — to our eyes — neither cute nor cuddly. They come in a variety of colors from drab brown to drab green. The female’s shell is shaped differently from the males, and females are about 25 percent bigger. The long tail looks dangerous but it isn’t. In fact, you might say they’re ugly, especially when they gather in tangled piles — usually with a female at the bottom — the sound of shell scraping against shell as males crawl around looking to attach themselves to the less numerous females. Other crabs crawled or drifted in the fairly gentle waves that washed over the piles. Perhaps we seem just as peculiar to the crabs, as we slosh around in our wellies (mine are multi-colored) in the dead of night (high tide was at 10:06 p.m.) with our headlamps flashing. Just as these crabs are drawn to the water’s edge, so are we — a crab survey team from the Delaware National Estuarine Research Reserve, one of many from the DNERR. Several teams are out several nights and our teams join up with many other organizations all over the bay to gather the data that will help determine if the crab population is growing, declining or stable. 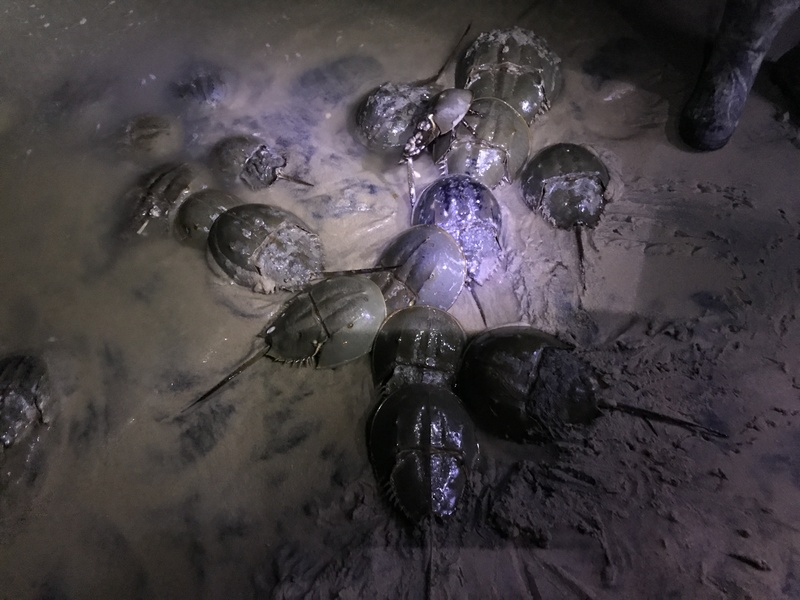 The stars of tonight’s show — the horseshoe crabs on the beach at high tide. Males arrive on the beach first and are smaller than the females. You can’t help but root for these amazing animals. They come ashore to mate, and a female could come ashore more than once and lay more batches of thousands of eggs on different nights. Once they’re done they go off into the ocean where not much is known about their lives. The average lifespan is believed to be somewhere from 20 to 40 years, but the first couple of years are the hardest — that’s when they’re small and make a tasty treat. And even earlier, the eggs themselves are a vital source of protein for the red knot, a bird celebrated for one of the longest migratory flights from where they spend the winter at the tip of South America, flying 9,000 miles north to their breeding grounds in the Arctic. Their stopover — for about a month — on the shores of the Delaware is vital for them to gorge on the protein-rich eggs. We gathered first at St. Jones Reserve and then we all drove to North Bowers Beach and found our starting point not far from where a groin juts out into the bay. She says we need to get a stick and jam it into the sand so that we can see when the tide stops rising — only then can we start the survey. 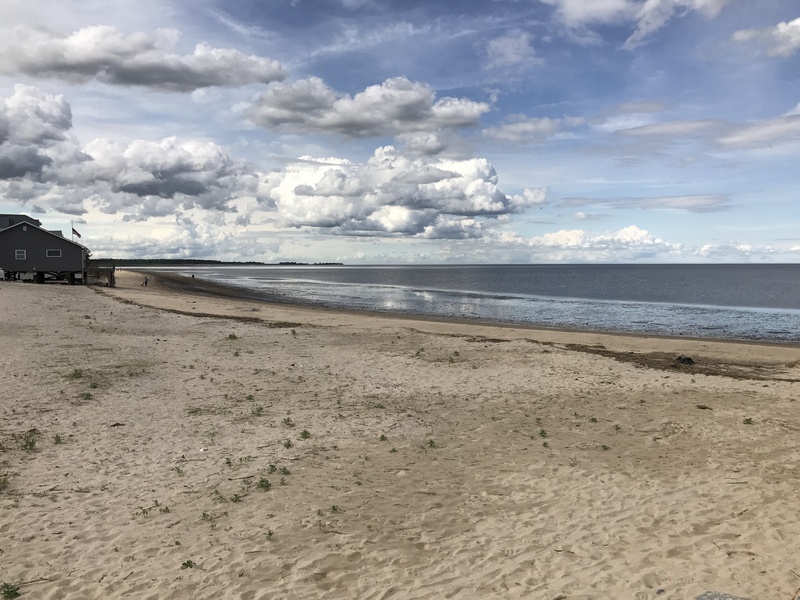 While we’re waiting, there’s chat about last night (May 24) when the tide was much higher and the crabs more numerous and the water much rougher, which is rough on the crabs. We have two teams each taking the count in a similar pattern but a different sequence along the beach. My teammates are experienced crab counters, a mother and daughter from Allentown, Pa. Mom, Nancy Hofman, is up pretty late (for her) and is happy when we move along and don’t dawdle. She’s our recorder. Her daughter, Gwen, has a background in biology and is clearly in her element. She’s our counter. Each team carries what looks like a large white picture frame, made from tubing. The “counter” holds the front edge just inside the water line with her foot, and lets it drop into the water, and wherever it falls, we count the crabs within. Sometimes there are no crabs at all, sometimes one crawls in as we’re counting — that one doesn’t get counted. Sometimes your “picture frame” falls where there’s a pile of crabs, then you have to dig around in the water and sand to find the female that’s likely at the bottom. She lays from 15,000 to 50,000 eggs at a depth of 15-20 cm. The eggs are fertilized by one or several males. As the newbie, I’m happy mostly just to watch, but all insist that I count at least some of the quadrants. Some of the crabs are tagged by other researchers and there’s a bit of a fuss made when you count your first tagged crab, which I did. Now I report it and I’m told I get a pin! Hey, this is better than Girl Scouts! Here’s the tagged crab that we spotted. Research will shed some light on the lives of these mysterious creatures when they’re not on our beaches. We pace about 20 meters, lay down the quadrant, count and move on, making 100 stops in all. Just ahead of us is a two-person team, husband and wife, Ellen and Fred Ainge. They’re locals, and make these sorts of citizen scientist excursions quite regularly. They are planning to help out with the bay’s terrapins — turtles that usually live in Delaware’s Inland Bays but have to get to the sea to lay their eggs in the soft sand. Tonight, in one place the water has risen under one of the houses — they’re mostly on stilts — but the homeowner has put a fence around the “legs” of the house. The water is high and as we pass I’m hanging on to the fence while I lift one foot up and then try and put it down without stepping on one of the crabs — not an easy job since they’ve lost their footing in the sloshing water and they’re sort of rolling around — I can feel them bumping into my leg. It occurs to me that we share something distinctive with the crab: a singular focus on getting as close to the beach as possible. This little settlement hugs the beach from the land side, as the crabs work toward the beach from the ocean. As the survey progresses, you become aware of the fragile equilibrium of life — we humans are Johnny-come-latelys on the earth’s natural playing fields.The red knots and the crabs have been balancing each other for millennia. Not 20 years ago, it would have been hard to walk on this beach at this time of year. It would have been covered with crabs, and birds. Now, there are fewer crabs, and the bird surveys are showing us there are fewer birds. No one yet knows what caused the crabs’ numbers to fall, but I was proud, actually really thrilled, to play a small part it in this enormous effort by so many people and organizations to figure it out. With any luck we can save these amazing creatures and they’ll never know we did. They’ll just keep doing what they’ve been doing for thousands of years. The horseshoe crab isn’t a crab. It’s in a class (called a subphyllum) of critters called Chelicerata. Horseshoe crabs are more closely related to a class called arachnids — spiders! The oxygen-carrying pigment in horseshoe crab blood is a protein called hemocyanin. It is very similar to the hemoglobin molecule we have in our blood. Hemoglobin gets its red color (which makes our blood red) from the iron molecule in the center of the protein. Hemocyanin contains a copper molecule which results in a blue color. More here. That blue blood is very helpful to humans. Crabs don’t have our array of disease-fighting tools. But they do have a process that can encapsulate a dangerous bacteria in a gel-like clot and render it harmless. Back in 1956, scientists Frederick Bang and Jack Levin noticed this process and thought it could help ensure that equipment (like needles) used on humans were safe from disease-carrying bacteria by using the crab’s process to “test” for sterility. If it was sterile, no clots, if it wasn’t clots would form and signal a problem before it caused a problem. It’s called the Limulus Amebocyte Lysate (LAL) test. More here. Not one eye, but 10. This species got the second part of its name — Limulus polyphemus — from a misunderstanding of crabs’ eyes. It was thought that the crab had one eye, so it was named after one of the Cyclopes in Homer’s Odyssey. But here’s the funny thing: They have 10 eyes if you include the photoreceptors they have on their tails. 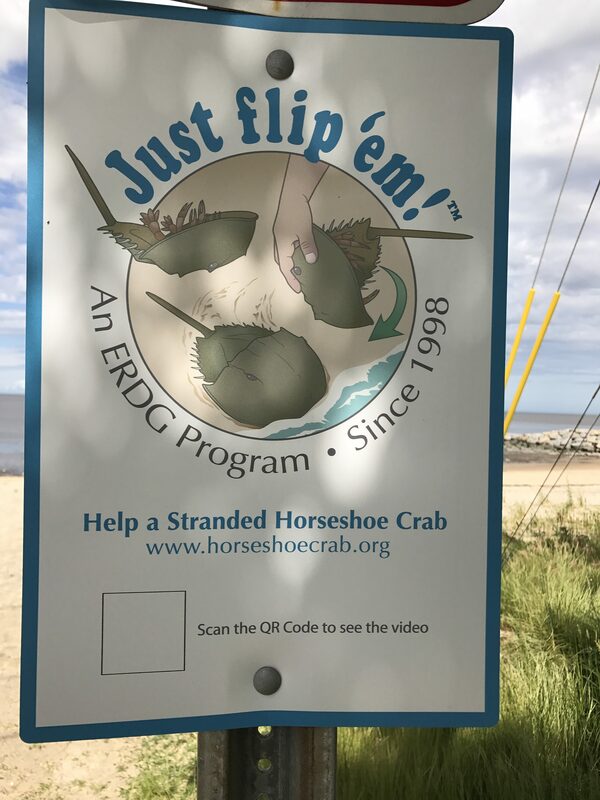 In 1998, the Ecological Research & Development Group (ERDG) launched its highly successful Just flip ’em” program to bring attention to the high mortality horseshoe crabs incur from being stranded up-side-down during spawning and to encourage, through a simple act of compassion, an appreciation for this remarkable creature which would not survive public indifference. The horseshoe crab’s forebears were around 450 million years ago, so they are sometimes called living fossils, but they have evolved since those times. The horseshoe crabs of today aren’t the same as their prehistoric ancestors, but are drawn from a similar model. Crabs come ashore to spawn in the spring high tides, when the moon is either full or new. My theory is that they can “see” the full moon underwater, but the new moon? That’s dark. horseshoe crab 1: The stars of tonight’s show — the horseshoe crabs on the beach at high tide. Males arrive on the beach first and are smaller than the females. 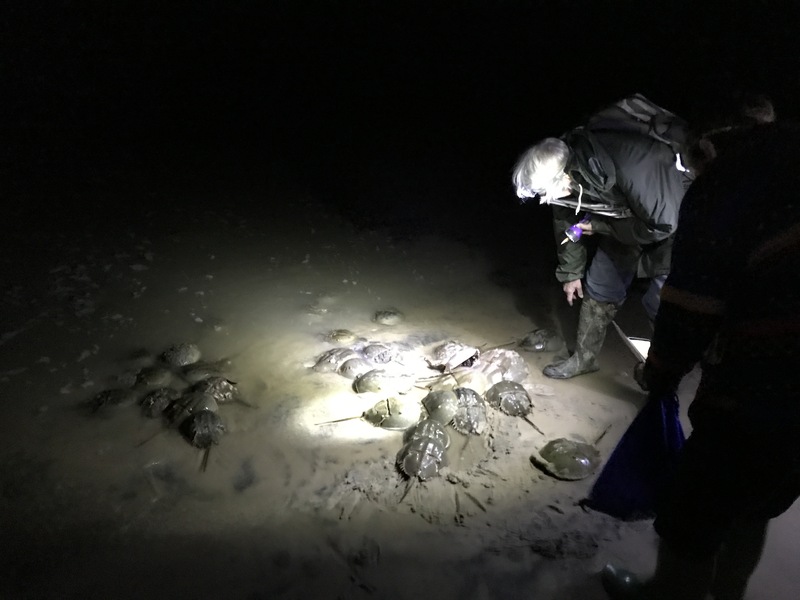 horseshoe crab 3: Volunteers spend a moment talking about the crabs and other survey days — sometimes the weather and the water is much rougher than this night. horseshoe crab 4: (to go with the Seven cool facts) Signs like this are on this beach and others, encouraging people to help a crab when it gets stuck. That’s when they are vulnerable to birds. horseshoe crab 5: With that long tail, the horseshoe crab can look scary but there’s no pinching or stinging from this harmless creature. 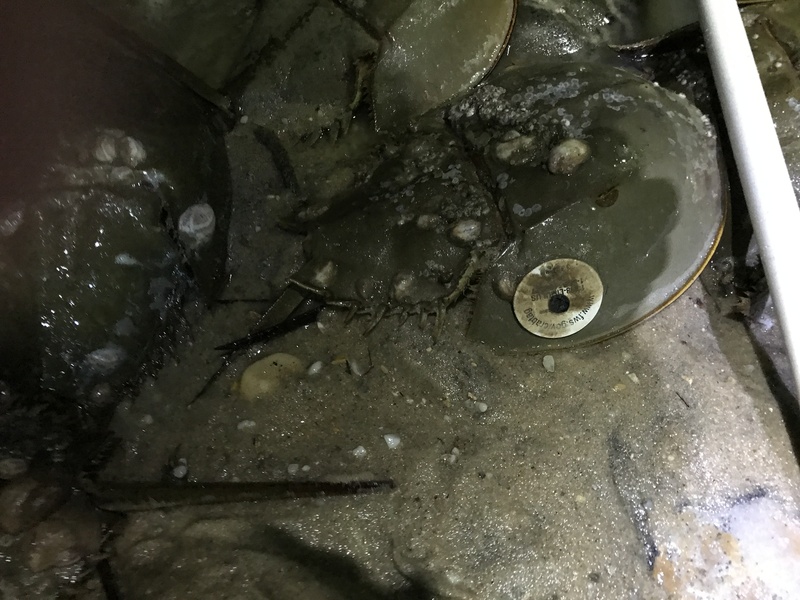 horseshoe crab 6: Here’s the tagged crab that we spotted. Research will shed some light on the lives of these mysterious creatures when they’re not on our beaches. horseshoe crab vid 1: Volunteer Ellen Ainge explains the records kept of the count. horseshoe crab vid 2:Volunteer Gwen Hofman shows how the crabs are counted.